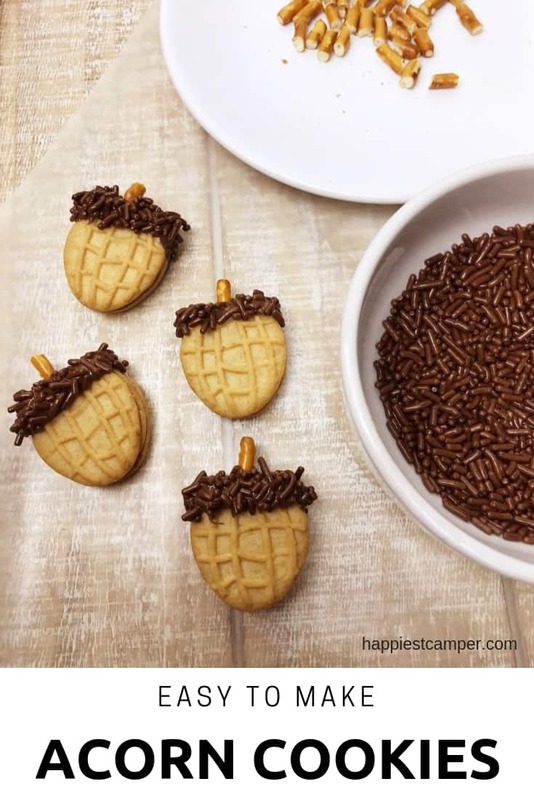 These easy acorn cookies are adorable and truly simple to make. They would be fun to add to a Thanksgiving dessert table or a fall birthday party. 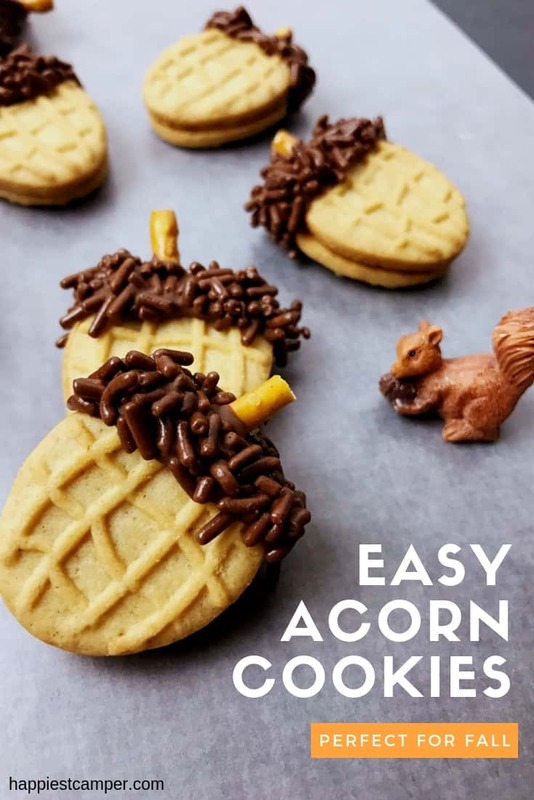 You don’t need a special occasion to make easy acorn cookies though. My two-year-old son becomes more interested in nature every day. We recently took a walk, and he happily collected rocks, leaves and acorns along the way. Then we made easy acorn cookies to reinforce his learning and all the fall feels. It’s a good thing they are easy to make because you’ll want to eat about 10 of them. They just pop right in your mouth with an explosion of peanut butter and chocolate flavor. The classic combination is irresistible! 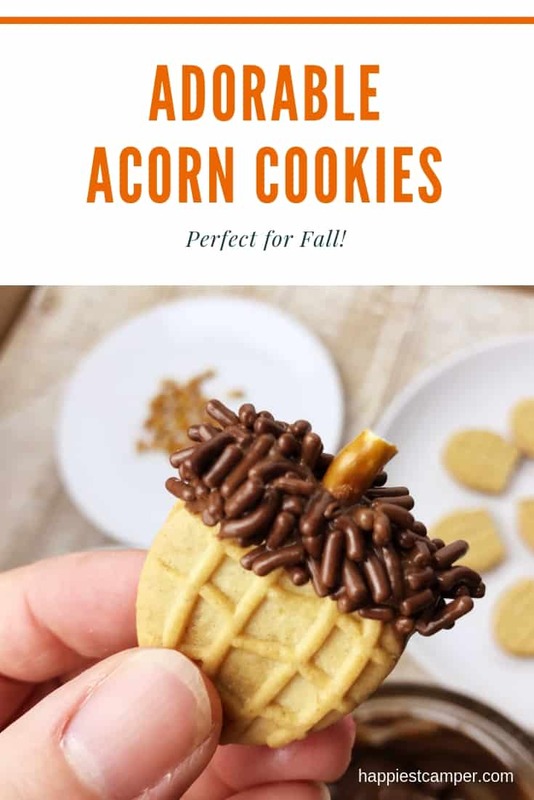 Easy acorn cookies are sure to be a hit with your family and friends. They would make a super cute hostess gift too. Cut pretzel sticks into six pieces. These will be the stem of the acorn, so cut as many stems for as many cookies as you are making. 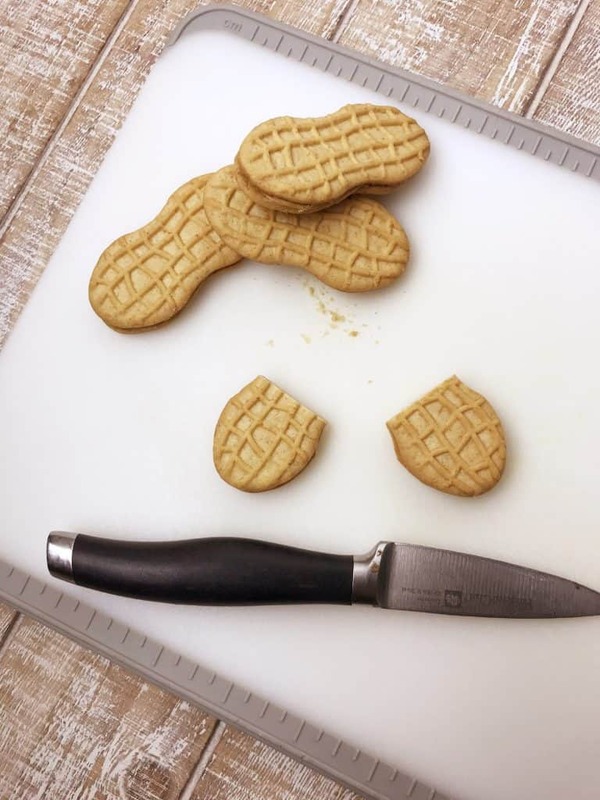 Using a sharp knife, carefully cut each Nutter Butter cookie in half. Place chocolate in a microwave safe bowl. Microwave on high for 30 seconds. Stir and repeat until the chocolate is melted. Arrange the ingredients so they are in close proximity as shown below. 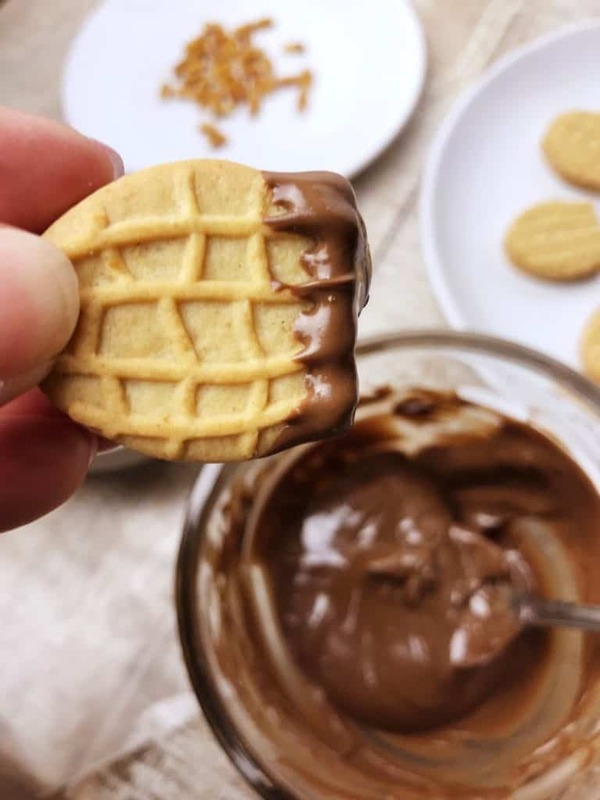 Dip the cut end of each Nutter Butter cookie into the melted chocolate to coat 1/4 inch of the cookie. 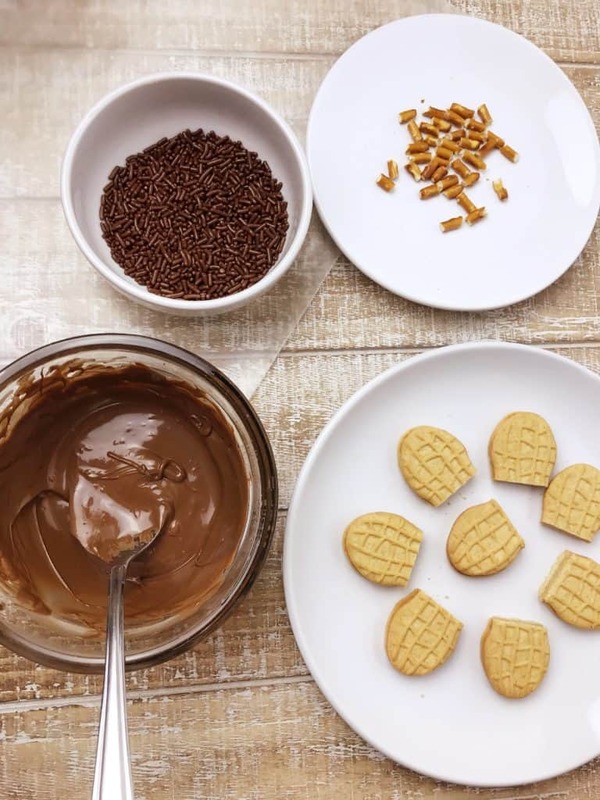 Immediately dip the melted chocolate coated cookie in chocolate sprinkles. Place a piece of pretzel stick in the center of the melted chocolate/sprinkles edge. 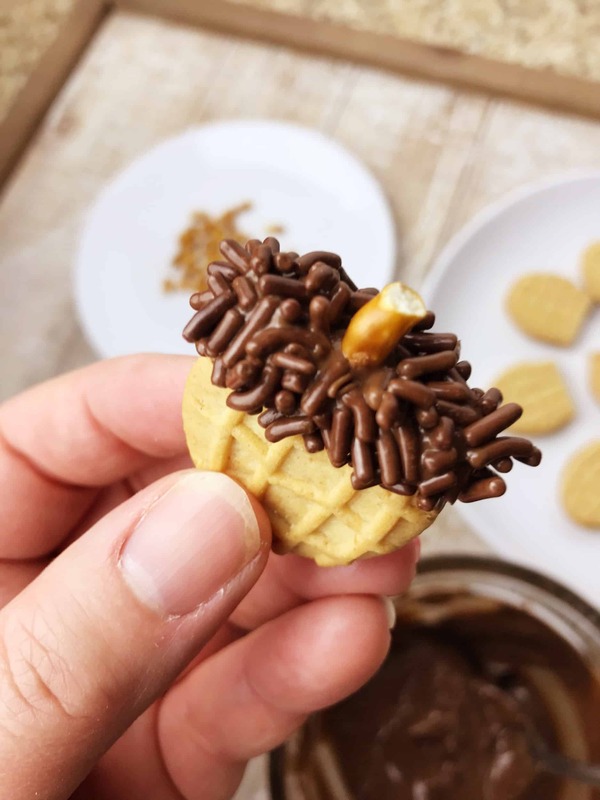 If the pretzel stick will not stay, dip it into the melted chocolate and attach. Set the acorn cookies on waxed paper and refrigerate or freeze until the chocolate is set. 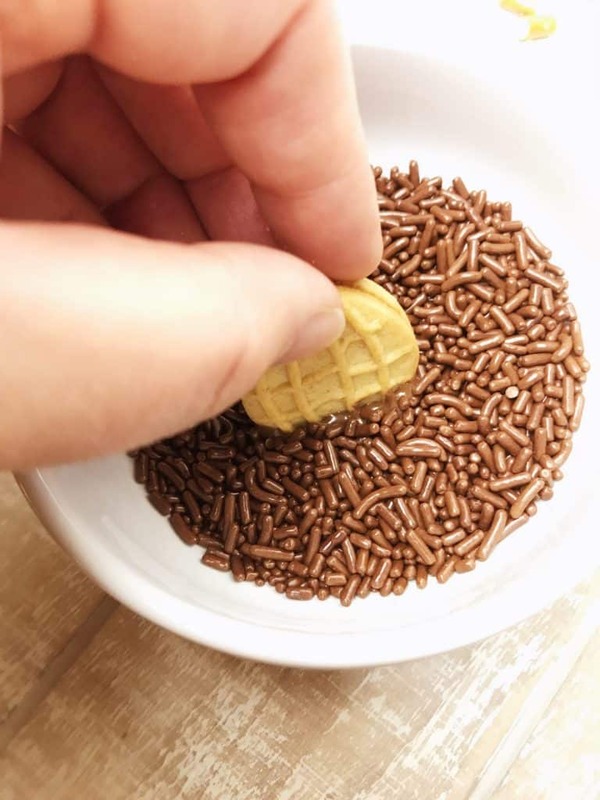 Store the easy acorn cookies in an airtight container at room temperature. 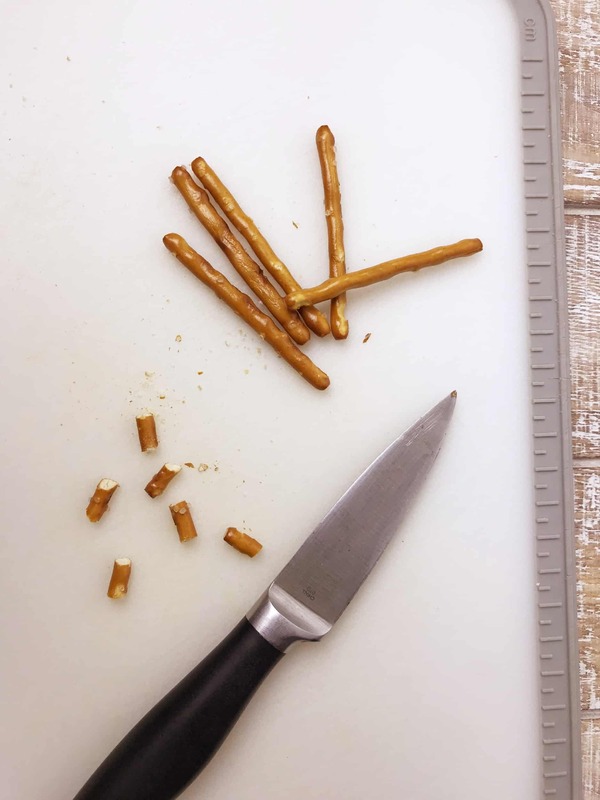 Cut pretzel sticks into six pieces. Place a piece of pretzel stick in the center of the melted chocolate/sprinkles edge. ﻿Set the acorn cookies on waxed paper and refrigerate or freeze until the chocolate is set. You'll need about 1/2 cup of chocolate per 8-10 Cookies. Enjoy! Be sure to make extra because you’re going to need them. These cute little guys go fast! I love these cookies and they are just so simple! I’d be honored if you shared this at our What’s for Dinner party. Thank you! I’ll check out your linkup for sure. 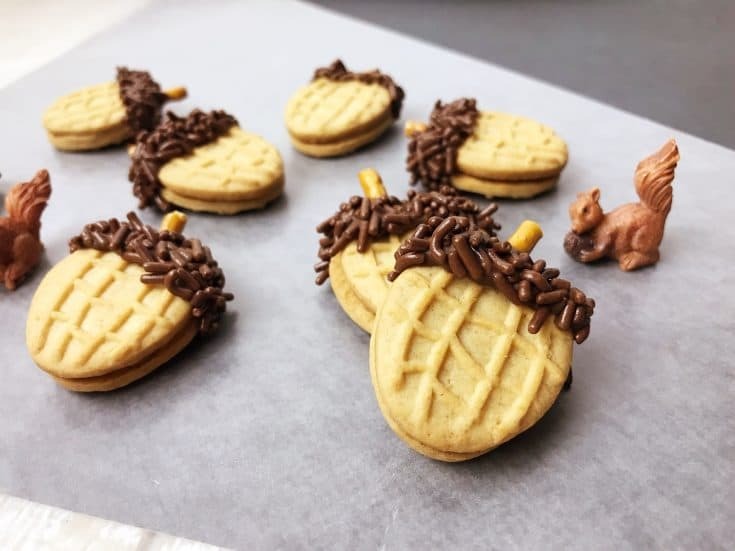 These are so cute, my son will love these as a snack after school. Very clever! I could see that these would be fun to make! They are even more fun to eat!